to enable you to begin communicating quite quickly with the Indonesians around you. SIB School has several programs in Bahasa Indonesia to fit your needs in business or if you just plan to associate with Indonesians in everyday life. In addition to Company classes, we have Private or Classroom courses for all ages. All materials are created and written by SIB School staff teachers and have been time proven. Excellent language courses, for a Good Price, at Times and Location of your Convenience. Students will be very pleased with the education provided. Each continuation of our program will take you to higher levels of conversational Bahasa Indonesia building vocabulary skills, more complex sentence structures, prefix and suffixes, including some writing and other language functions for you to effectively communicate with Indonesians. On completion of this level, students will be able to communicate simply with Indonesians in Bahasa Indonesia. Skills in greetings, numbers, time and describing things, amongst other skills, are introduced at this level. Students will know how to make basic sentences and ask questions using their newly acquired vocabulary. At the end of this level, students will know how to communicate on a wider range of topics, using a larger vocabulary. Students will study how to ask and offer things in addition learning quantifiers and comparisons. By now the student will be communicating in limited Bahasa Indonesia. To expand their vocabulary, this level introduces prefixes and suffixes in different functions. They will be capable of how to use conditional sentences, how to have open discussions, how to agree or disagree and how to refuse or accept. They will also understand the direct and indirect speech expressions. Speaking skills will be enhanced to a point where the student will know how to use various different structures and functions of Bahasa Indonesia. Writing letters is also introduced in this level. After these final levels, the student should be fluent. They will know how to identify the different styles of Bahasa Indonesia that are used in conversations and various media in addition to improving writing skills. This course is specially structured for kids to learn Bahasa Indonesia as a second language in a fun way, through pictures and communicative approach. On completion of this level, children will be able to communicate in basic Bahasa Indonesia with people around them; reading, speaking, listening and writing, so they will be more adaptable in Indonesian environment. On completion of this level, students will be able to communicate in basic Bahasa Indonesia; reading, speaking, listening and writing. This course is designed to prepare the student to have proficient basic conversation skills in Bahasa Indonesia and a respectable knowledge about Indonesian culture and customs, so they will be more adaptable in Indonesian environment. Students will apply what they have learned in the First Steps to Indonesian Language & Culture program through discussions, reading passages, role-play and describing pictures. In this level the student will also learn some ”tricky words” in Bahasa Indonesia that sometimes can’t be translated to English; therefore, the student has to know when and how to use it, such words as ‘ada’, ‘adalah’, ‘akan’, ‘nanti’, and ‘lagi’ that have various translations depending on the context. These courses will enable you to understand the idioms, phrases, slang, colloquial, and informal versions of the language that are commonly used in daily conversational situations. Focusing in all four skills of the language; reading, writing, speaking and listening, the courses will include various kinds of exercises from written dialog to audio conversations that will accommodate the learner’s needs to understand the language as a whole. 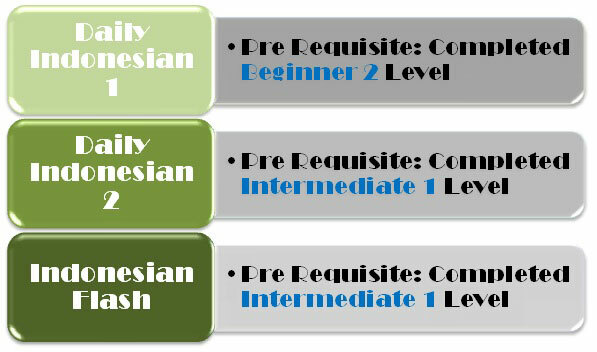 Daily Indonesian 1 Pre-requisite: Completed Beginner 2 level. Get ready to refresh your Bahasa Indonesia ability. This program will sharpen your communication skills in various interactive (role-play) situations that will prepare you to communicate more effectively than before.